[Updated] At approximately 8.45am this morning [April 13] there was an industrial accident in the St Augustine area of Pembroke, in which we understand a man was injured after falling off a ladder. Police and fire personnel are on scene, and further details are limited at this time, however we will update as able. 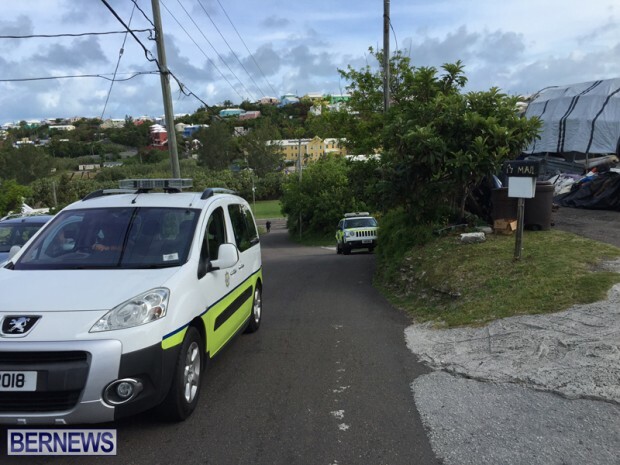 Update 9.52am: Police Media Manager Dwayne Caines said, “At approximately 8.50am, police and first responders attended a report of an incident that took place on St Augustine’s Lane in Pembroke. “It appears that a painter on a Bermuda Housing Corporation rental unit had started the process of working on that unit, when the ladder became unsteady and the 36-year-old male fell approximately 25 feet to the ground. Update 10.26am: The BFRS said, “At 8.54am today, the Bermuda Fire and Rescue Service responded to an incident where a male who is approximately 36-years-old, had fallen approximately 35 feet from the roof of a St. Augustine Lane residence. BFRS Staff Officer Mark Prior said, “One Fire service vehicle manned with four personnel responded to the incident and administered emergency medical assistance to the man, who appears to have sustained non-life threatening injuries. Hope he is OK.Another reason for government to actually enforce our health and safety regulations. Fall arrest is law when working above 2m. Renamed Safty and Health now. I truly hope this gentleman is ok. But Yadon, it’s not the government’s responsibility to be everywhere all the time. People have to take personal responsibility for their actions, and the accountability to adhering to basic health and safety lies with each individual. There is a time and a place for government interference – but monitoring the actions of individual painters on a residence is not one of them imho. Just wait one minute ! We do not have any industry here . Do we ?